In school, Johannes Strobel was puzzled at the seemingly poor methods professors used to teach complex topics. This confusion led Strobel to become interested in how people learn, especially with human-made artifacts and processes such as those developed by technology and engineering. Strobel, assistant professor of engineering education and learning design and technology, studied philosophy, religious studies, psychology and information science in Germany before receiving his M.Ed. and Ph.D. in information science and learning technologies from the University of Missouri-Columbia. 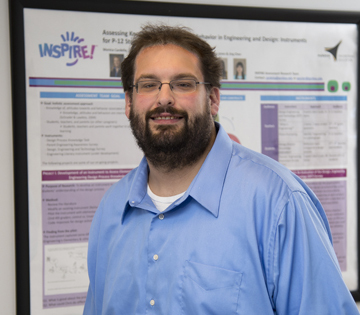 Strobel is also the director of INSPIRE, the institute for P-12 engineering research and learning. You have a very diverse education. How do you feel this helps you in the university setting? Originally I wanted to be a monk, and I actually was one for two years. However, for a variety of reasons I chose to change my direction. Still, I finished my degrees in theology and philosophy before moving on. I do think my previous education helps me now. For example, I research the epistemology of engineering -- how engineers think and know things -- how indigenous cultures practice engineering, or engineering as an empathetic and caring discipline. How does your research collaborate across colleges? I have a joint appointment with the College of Engineering's School of Engineering Education and the College of Education's Department of Curriculum and Instruction for learning design and technology. I'm additionally an affiliate faculty with the environmental and ecological engineering division. You could say that I'm "academically nomadic," in that I don't have one true home for all of my work. So as I'm "wandering between the worlds," I'm challenged to have to speak different "languages" and know multiple discourses, but I also meet a lot of people. I can be working with an entirely different set of people depending on what I'm researching. For example, I've found that many engineering students don't believe sustainability is pertinent to them, which is puzzling to me. So I’m looking at a range of reasons for why they feel this way and how we can fix that mentality -- from analyzing their resistance to change (which is a theoretical construct in psychology), engineering education and the habits of students, to environmental education within the realm of science. In the end, something that starts out as a miniature question unfolds into something that takes much more than looking into a single area. I also see a lot of patterns and upcoming trends by working with so many different people. Many of my projects involve science, technology, engineering and math disciplines within the K-12 setting. I work with school administrators, teachers and national organizations that create policies in K-12 STEM education, and sometimes one group starts planning or doing something years before another group comes up with and adopts the same idea. By staying out of one niche, I sometimes see these trends coming much earlier than someone who is only studying one area. How is your work with INSPIRE influencing engineering education? INSPIRE is a University-recognized center within the School of Engineering Education. We're researching and evaluating what it means to be practicing and learning engineering in the pre-college setting, as well as studying both informal and formal education, with informal education ranging from how parents talk to their children to how science museums influence girls' perceptions of engineering and science. We've also started a new journal, the Journal of Pre-College Engineering Education Research, and we house an assessment center that holds resources for practitioners to rigorously assess engineering ranging from knowledge and skills to attitudes and motivation of both students and teachers. What major changes are happening in STEM education? There are dramatic shifts going on in K-12 STEM education right now. One is that we will soon have new science standards so that for the first time in history, engineering will be officially part of science teaching. The other is on the standardized testing front -- through the National Assessment of Educational Progress we will have two grade levels that will be tested on engineering and technology knowledge on a national basis. These are possibly the biggest changes to happen for K-12 engineering education in the last 50 years. Efforts are also being made to redefine engineering and portray it in school as more of a social good; instead of seeing how far we can catapult an egg, we should be doing projects to find how to optimally protect the egg from a far fall. By working on projects that focus on protecting or building instead of destroying, we can show younger students how being an engineer can make a difference and help others. What other research topics are you working on? I’m involved in research right now in online learning and cyber-enabled infrastructure, which, along with pre-college STEM education, is one of the biggest changes occurring in the education landscape. One of my studies relates to chronobiology, and looks at how people's "inner clock" determines how they interact in online classes. Our research finds that "night owls" are, naturally, spending more of their online learning environment time at night. This is a very good argument for the necessity of online education --people can work and learn when they are most efficient. In this same instance, our research might indicate that forums instead of online chats are better for discussion, as more people can interact and can do so when each individual is at their prime learning time.